Last year Julian Tatlock Landscape Design was commissioned to redesign the Gardens of the Rose. This is the prestigious headquarters of the Royal National Rose Society. It was part of an ongoing £750,000 redevelopment project. The brief was simple: to showcase the beauty, history and diversity of roses. The Gardens of the Rose span five acres, surrounding a 19th century manor house. Thousands of visitors explore the Gardens every year. After many years of the same thing, it was time for the visitor experience to be updated. We were asked to create a master plan for planting that would revitalize the Gardens and bring them into 21st century. We decided to move away from the linear planting style of traditional rose gardens and design a garden of free flowing and free flowering plants. We took elements from the archetypal English cottage garden – peonies with their curly petals, bell-headed campanulas, fragrant mint and honeysuckle, vibrant salvia and clematis – and combined them with strong, contemporary structures of yew, hornbeam and beech columns. Many of the Gardens’ existing beds were between 5 and 10 metres wide. This made it impossible for visitors to fully appreciate the roses and their companion plants, let alone the intricacies of the planting. The Julian Tatlock Landscape Design team redesigned the gardens to open up the beds by creating grass pathways that curved through the planting. These dramatically enriched the visitor experience by encouraging individual exploration. Visitors now found themselves coaxed into new areas, following their curiosity down winding paths that disappeared behind lime trees, pergolas and shrub borders. To ensure visitors had places to stop along their way, the master plan included strategically placed resting spots. These seats and benches always faced a focal point for the visitor to enjoy, such as ponds, statues or majestic trees. These resting spots also allowed visitors to take a moment to appreciate the closeness of the flowers, and enjoy their many scents and colours. The previous layout of the Gardens had made them a difficult place to lose yourself in, made up of mostly soft, low-level planting. We wanted to encourage exploration, and decided to give the Gardens a stronger structure with more variation in height. The master plan incorporated willow trees within the pergola and pond garden, which complemented the tall purple beeches and created cool, shady areas that visitors could enjoy on hot summer afternoons. A new group of tall Indian bean trees enticed visitors to discover the beds of old rose species beyond, and in the distance mahogany-stemmed Prunus Serrula planted amid giant oat grasses provided a shimmering backdrop to the Gardens. The stronger structures introduced in the master plan created smaller, more intimate areas. Yew hedges planted to divide the Gardens and shield some of the more vulnerable planting allowed the flowers to be revealed gradually, and created enclosed areas of roses and soft perennials. I also designed an elliptical pergola for the Gardens, which was smothered in climbing roses of all colours. This shady retreat was filled with their heady perfumes, set-off by the fragrance of Munstead lavender planted along the pergola’s base. The structural planting was designed to act as a foil for the roses, elucidating their softness, colour, shape and character. Dark Sambucus ‘Black Lace,’ Red-hot pokers and 6-foot Snapdragon rockets added strong, vertical accents, as did Verbascums, White Foxtail Lilies and columns of Irish Yew. Around these my team and I planted grasses for a contrast in form, such as coppery Carex buchanii and wispy Stipa tenuisissima, which moved in the gentlest breeze. 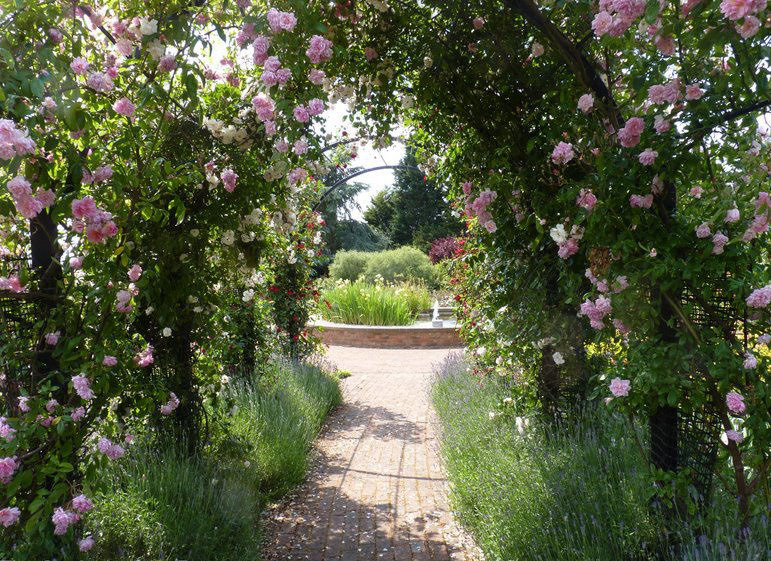 By adding structure, contemporary planting, winding paths and enclosed areas, the Julian Tatlock Landscape Design team transformed the Royal National Rose Society’s traditional gardens. In the new Gardens of the Rose visitors create their own experience, rather than following the crowds, something we have found that appeals to both the traditionalists as well as the new generation of rose lovers.